Brekeke Contact Center Suite (CCS) is a collection of software for building a hosted call center/contact center system. The software programs included in the suite are Brekeke Customer Interaction Manager (CIM), Brekeke Contact Analytics (CA), and Brekeke CRM. Ready for hosting 100+ tenants in one system, with multi-workspace available under each tenant. The system allows each tenant to manage multiple campaigns from different clients. Brekeke products utilize given resources effectively and provide the best performance in each system. Brekeke offers a powerful dialing engine and a various types of dialer functionalities and settings. 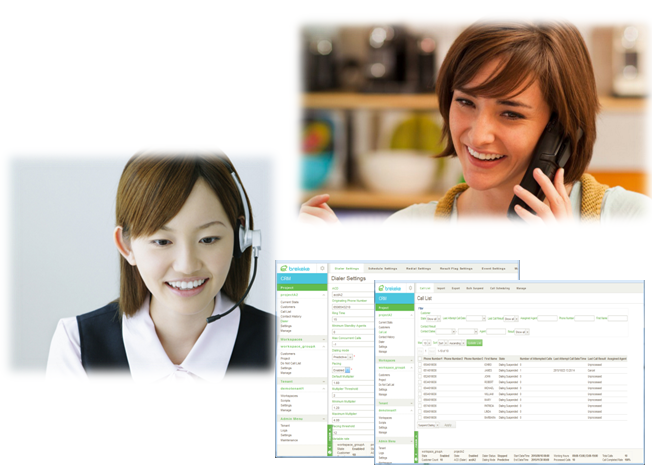 Brekeke provides smart IVR functions and call flow design. 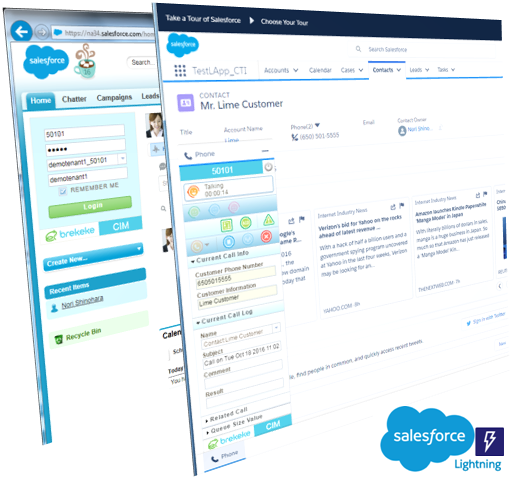 Brekeke CIM client can be fully integrated with the Salesforce screen. The agent tool menu (CIM client) works as a browser widget. You can use it as part of a side bar or in the Salesforce console. Brekeke Contact Center Suite (CCS) is a collection of software for building a hosted call center/contact center system. The software programs included in the suite are; Brekeke Customer Interaction Manager (CIM), Brekeke Contact Analytics (CA), and Brekeke CRM. Brekeke Contact Center Suite (CCS) offers a powerful multi-tenant feature, so it’s perfectly suited for use as a cloud call center. 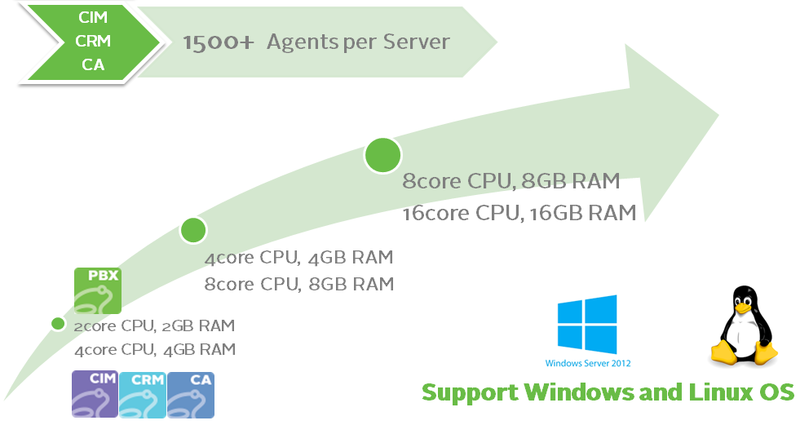 Also, as an additional benefit of using Brekeke’s robust products, companies can host 100+ tenants per server. By using Brekeke Contact Center Suite, companies can host 100+ tenants per server. Multi-workspace concept allows each tenant to manage multiple campaigns from different clients. Brekeke offers a powerful dialing engine and various types of dialer functionalities and settings. 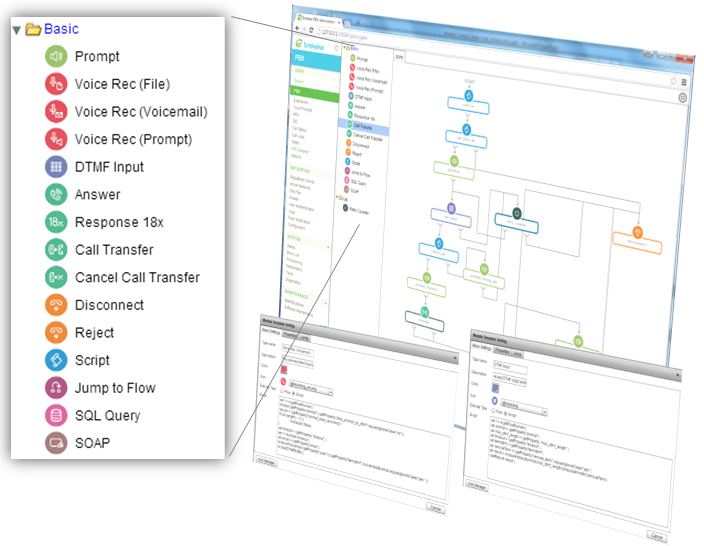 Brekeke provides smart IVR functions and call flow design. Drag and drop to create a call flow visually and intuitively. The agent tool menu (CIM client) works as a browser widget. You can integrate Brekeke CIM client with the Salesforce screen by updating a configuration file. Brekeke provides the Brekeke Phone Bridge for ZOHO CRM. Supporting the industry-standard Session Initiation Protocol (SIP), Brekeke SIP Server provides a reliable and scalable SIP system platform for telephony carriers, communication service providers and integrators, as well as manufacturers of SIP products. Brekeke PBX is an SIP-based IP-PBX product that can create telephony systems for enterprises and service providers. Brekeke PBX comes with a variety of useful features, ranging from the most popular office phone options to the more sophisticated features that large call centers require. Brekeke UC is an integrated communication platform. 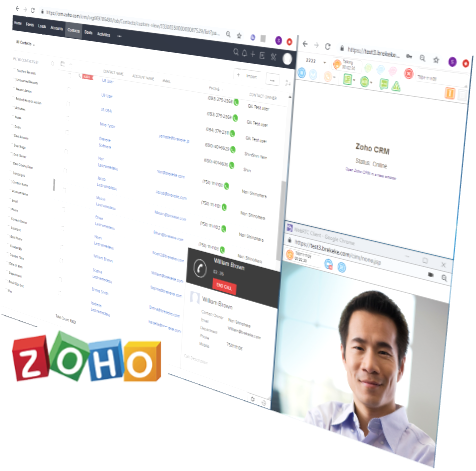 Based on WebRTC technologies, it provides chat, voice call, video conference, and content sharing features. Brekeke Software, Inc., is an industry-leading developer of SIP (Session Initiation Protocol) software products for IP (Internet Protocol) network communications. We design and develop all of our products with great care and attention to detail, which is clearly evident in the wide array of high-quality products that we offer today. Brekeke products set such a high standard in quality and reliability that they are deployed as mission-critical communication platforms for healthcare systems, military and emergency communication systems, mass-communication environments such as call centers and financial institutions, and SIP telephony platforms for a large number of SIP applications and SIP telephony networks. Founded in 2002, Brekeke is headquartered in San Mateo, California. We are excited to introduce our brand new support portal site, Brekeke Documents. The site is the best place to come when you need additional product information and to find out current and upcoming news about Brekeke. Brekeke CCS now supports Aculab’s Call Progress Analysis (CPA) feature, adding answering machine detection and live speaker detection. Summer is ending… but our aspiration never ends! We’ve made lots of improvements in v3.7. We’ve added WebRTC-based softphone, allowing free unlimited codec G.729 sessions, removing the minimum fee requirement for redundancy setup for Brekeke PBX and more. But most of all, adding an auto provisioning feature has been one of the most important updates for our partners and users. Now, no minimum fee required to build redundancy system! From v3.7, the secondary license of Brekeke PBX is just a half price of the primary license. No more minimum fee required. We are introducing a light edition for our call center software, Brekeke Call Center Suite (CCS). Brekeke SIP Server and Brekeke PBX now support Web Push, allowing push notifications to be sent to Google Chrome. The latest version of Brekeke CCS supports WebRTC. It can bring numerous benefits to your contact center system. 1730 S. El Camino Real, Suite 400, San Mateo, CA 94402 U.S.A.